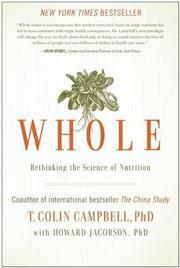 Campbell (Emeritus, Nutritional Biochemistry/Cornell Univ. ; The China Study: The Most Comprehensive Study of Nutrition Ever Conducted and the Startling Implications for Diet, 2005) elaborates on the themes of his earlier book and the 2011 documentary film Forks Over Knives. In 1980, the author began a study with Chinese scientists to investigate how the transformation of the Chinese diet in the aftermath of the stringencies of the Cultural Revolution affected the health of a sample of 100 Chinese families living in two different rural counties. A comparison with mortality statistics 20 years earlier showed a significant increase with the introduction of more protein in their diets. While admitting that these conclusions (taken from the original China study) are based on correlations and do not establish causality, Campbell does base his dietary recommendations on those conclusions. He claims that the adoption of a whole-foods, plant-based lifestyle can prevent 95 percent of all cancers, nearly all heart attacks and strokes, and even reverse severe heart disease. The author cautions against the use of dietary supplements and multivitamins and rejects the potential of targeted drugs as well as traditional medical remedies such as chemotherapy and radiation. He attempts to buttress his conclusions by referring to experiments conducted on rats in which the incidence of cancer was significantly higher for those fed a diet high in animal protein. Campbell dismisses the failure of medical and scientific journals to publish papers that he has written over the years, attributing this to biased peer review and financial pressure from doctors, the pharmaceutical industry, and dairy and livestock producers. While his earlier book had impressive sales figures, he complains that the media has failed to showcase his work. A spirited but unconvincing defense of Campbell’s earlier work.